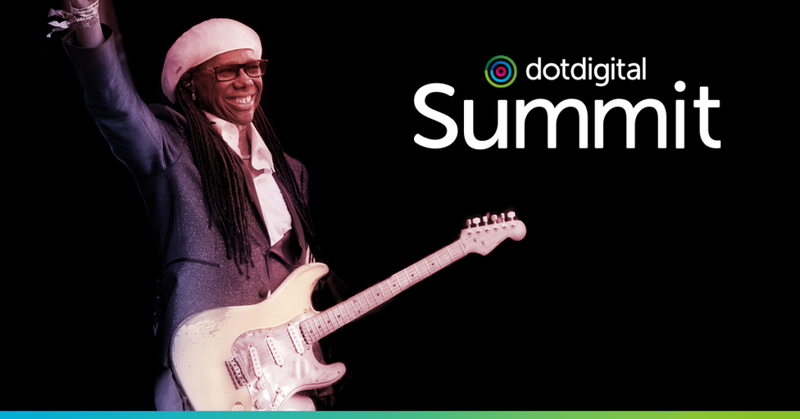 The man behind hits such as ‘Like a Virgin’ by Madonna and Pharrell Williams’ massive hit ‘Get Lucky’ with Daft Punk will be closing the dotdigital Summit. Not a stranger to complex situations, Nile was born in New York to his 14-year-old mother, Beverley Goodman, and father Nile Rodgers Sr. who worked for the John Glanzrock who would later become his white and Jewish stepfather. Growing up, his life was anything but smooth-sailing, but it was also the making of him. An incredibly skilled musician, his own band, CHIC, was catapulted into the pop charts in at the beginning of the disco movement and changed the face of pop music forever. Unable to keep his talent from the world, Rodgers and CHIC co-founder, Bernard Edwards, established CHIC Organization Ltd. for the music they produced within CHIC for artists outside of the group. With over 200 production credits to his name, including Let’s Dance by David Bowie, Notorious by Duran Duran and Like a Virgin by Madonna, his work has sold over 200 million albums and 50 million singles worldwide. Having worked with artists such as Diana Ross, Sister Sledge, INXS, Debbie Harry, Avicii and Sam Smith (to name just a few) you’ve undoubtedly heard this maestro at work. To complement his work in the music industry, Rodgers has scored soundtracks for a number of Hollywood blockbusters including Coming to America, White Hot, Thelma and Louise, and Beverly Hill Cops III to name a few. Aside from his insanely successful career, Nile has had to overcome his fair share of personal obstacles. From addiction to cancer, there’s nothing that can hold him back. Since his first gig when he was 19-years-old to today, Rodgers has only missed two performances in his 47-year career. Nile Rodgers continues to be a force for unity around the world through his music and humanitarian work. He was one of 75 acts to perform at Live Aid and released a unifying re-recording of We Are Family with over 200 musicians and celebrities in response to the tragedies on 9/11. His We Are Family Foundation (WAFF) is dedicated to the vision of creating a global family through programs that promote cultural diversity while nurturing the vision, talents, and ideas of young people who are changing the world. This article has barely scratched the surface of the extraordinary life of Grammy-winning composer, producer and guitarist, Nile Rodgers.